The Novotel Lens Noyelles hotel welcomes you to the heart of the Lens region. Whether it's for a business trip, romantic getaway or family vacation, you will love our quiet and comfortable rooms with views over a wonderful terrace. Our lovely meeting area with bespoke refreshment facilities is ideal for both business meetings and private functions. 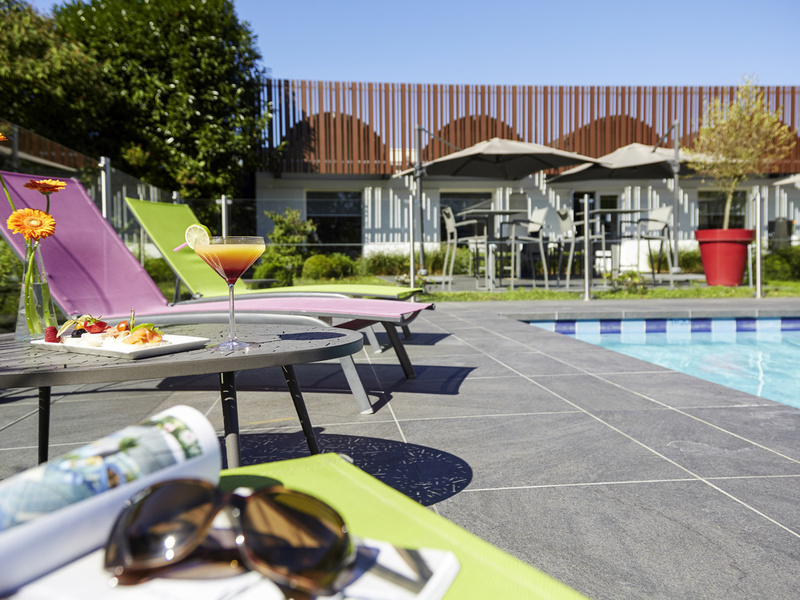 Relax in the bar or by the pool after learning more about the local mining heritage or visiting the Louvre-Lens museum. With free WIFI and car park access. Novotel Lens Noyelles is ideally situated right next to the biggest mall Nothern Paris and at the junction between A1 and A26. You are also nearby the Stadium Bollaert for the EURO 2016 and memory place of Vimy, Notre-Dame de Lorette, Mining history cenre of Lewarde, Louvre-Lens Museum or a guided walk in the coal mining area (UNESCO). Lille is only at 20 minutes by car from Novotel Lens Noyelles. Choose comfort and space. Rooms are equipped with all the usual facilities, including air conditioning, free WIFI and flat-screen TV with satellite channels. For up to 2 adults and 2 children. Children under 16 years stay free of charge. Choose the Executive Room to enjoy optimal comfort: slippers, bathrobe, relaxing shower with our essential oils capsules, Nespresso coffee machine, free minibar. For your business lunches or during your free time, the N'Café restaurant offers tasty, traditional and seasonal cuisine! The chef offers a "Menu du Marché" from EUR 19. Enjoy our terrace in good weather! Dear Mark, We sincerely thank you for having spent your stay at Novotel Lens Noyelles. We are delighted that you enjoyed your stay with us, and that you were also pleased with our restaurant and other hotel amenities. We would also be grateful if you could leave a comment on our TripAdvisor page: https://www.tripadvisor.fr/Hotel_Review-g651732-d287287-Reviews-Novotel_Lens_Noyelles-Noyelles_Godault_Pas_de_Calais_Hauts_de_France.html This encourages our team and helps us perfect our e-reputation. We wish you a pleasant day and hope to welcome you back to our establishment. Best regards. The whole team of Novotel Lens Noyelles. Amazing beds. Nice hall remodeling. Great location and very clean. Rooms were big and very comfortable. Only downside was flies on the ceiling in the bar area which was likely due to unseasonably warm weather in February. Poor service in reception both on arrival and leaving. Booked 2 rooms but only received welcome drink for one room. We were told the restaurant was full and recommended to eat out when in the event there was space in the restaurant and we did eat in the restaurant. Confusion over the bills when leaving and only received the bill for one room. Had to ask to pay for the evening meal which was on the second room. We had very good service in the restaurant itself. Good location and close to petrol station. Rooms were big and very clean and comfortable. The only negative was there was a problem with flies in the bar area which may have been due to the unseasonably warm temperatures. Kids loved it, if they’re happy we’re happy! Arrived at 2.30am, left at 8am but still managed a good night sleep on comfy beds, quiet room and good strong shower in the morning. No complaints and would use again. Dear Mr Bucks, We sincerely thank you for having spent your stay at Novotel Lens Noyelles. We are delighted that you enjoyed your stay with us, and that you were also pleased with our restaurant and other hotel amenities. We would also be grateful if you could leave a comment on our TripAdvisor page: https://www.tripadvisor.fr/Hotel_Review-g651732-d287287-Reviews-Novotel_Lens_Noyelles-Noyelles_Godault_Pas_de_Calais_Hauts_de_France.html This encourages our team and helps us perfect our e-reputation. We wish you a pleasant day and hope to welcome you back to our establishment. Best regards. The whole team of Novotel Lens Noyelles. The staff were excellent, the rooms great (although the air conditioning wasn’t working) but we weren’t as impressed as usual with the quality of the food this year. Having stayed a number times, we felt the food wasn’t its usual high standard. 3 of the party (of 8) had the Camembert to start and it wasn’t heated properly and the pastry was raw. The restaurant staff were too busy, so we didn’t complain at the time. Not the most friendly welcome at reception, but fine. Room was small for a family and way too hot. The heating seemed to be on high but no way of turning it off. It was about 15 degrees outside so no need to crank up the heat. Had to put on air con (not very good) to balance it out and open windows which is a security risk as we were on the ground floor. The breakfast was nice but a few flies buzzing around. Staff were excellent, breakfast bountiful and rooms comfortable and clean. Whilst only a 'night stop' we will return and explore more around Lens. Dear Mr H., We sincerely thank you for having spent your stay at Novotel Lens Noyelles. We are delighted that you enjoyed your stay with us, and that you were also pleased with our restaurant and other hotel amenities. We would also be grateful if you could leave a comment on our TripAdvisor page: https://www.tripadvisor.fr/Hotel_Review-g651732-d287287-Reviews-Novotel_Lens_Noyelles-Noyelles_Godault_Pas_de_Calais_Hauts_de_France.html This encourages our team and helps us perfect our e-reputation. We wish you a pleasant day and hope to welcome you back to our establishment. Best regards. The whole team of Novotel Lens Noyelles. As always staff very welcoming. Room very clean and comfortable though heating very hot. Power shower great. New design carpet in corridors made head swim. Bar and restaurant had good choice of drinks and food. It was as marvellous as every year. Excellent service, very friendly and helpful personnel, comfortable rooms, good food, best value for money, relaxing atmosphere as soon as you enter the hotel. Dear Mr K., We sincerely thank you for having spent your stay at Novotel Lens Noyelles. We are delighted that you enjoyed your stay with us, and that you were also pleased with our restaurant and other hotel amenities. We would also be grateful if you could leave a comment on our TripAdvisor page: https://www.tripadvisor.fr/Hotel_Review-g651732-d287287-Reviews-Novotel_Lens_Noyelles-Noyelles_Godault_Pas_de_Calais_Hauts_de_France.html This encourages our team and helps us perfect our e-reputation. We wish you a pleasant day and hope to welcome you back to our establishment. Best regards. The whole team at Novotel Lens Noyelles. I have stayed here several times a year because it is convenient as a stopover. The hotel is being upgraded and there were building works going on. It is a quiet and comfortable hotel - dog friendly. Ample parking. Although it says it has BBC World on the television, this has not been available for the last two visits, which is annoying as some of the guests are British. Very good breakfast. Dinner in the restaurant was disappointing. The pasta with mushroom sauce was awful - the pasta was dried rather than fresh or made on site, the mushroom sauce lacked flavour. A lot of the dishes seemed to be good from the description but did not live up to expectations. Good beds, and the best hotel in the area. Restaurant can be improved.